Radishes are usually a spring-time treat, but we are lucky enough to be able to grow them the entire season here at EverGood. We grow two varieties: french breakfast, and the traditional round red. We’ve tried growing some of the neat longer day varieties like watermelon radish, but we have too many insects that want to eat them and they come out looking pretty sad and full of holes. Radishes at the market sell so quickly. Sometimes we joke it’s our best selling vegetable! Our CSA boxes usually get them for the first 3 or so weeks, which makes some people really happy and others not as happy, as folks seem to either love or hate radishes. We always try to harvest them before they get too spicy though. 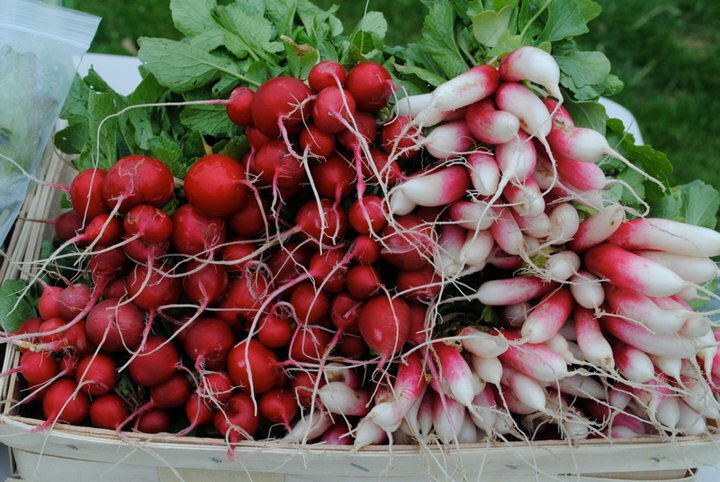 Radishes are made up of 90% water, so they are a good vegetable to keep you hydrated. They also have about as much potassium as a banana and half the ascorbic acid of an orange. They are also a good source of folate, magnesium, and vitamin C. Their greens are also very high in nutrients (similar to dark leafy greens). You can always toss them in a salad, soup, or sauté them. To keep radishes fresh after purchasing, immediately separate the root from the greens (this holds true for all root crops). Store the roots unwashed in a baggie, and treat the greens just like you would kale. The roots will keep for a few weeks this way and the greens about a week. My favorite way to eat radishes is just sliced up in a salad, or I love the long french breakfast radishes dipped in hummus. If you are feeling creative, here are some different uses for radishes. 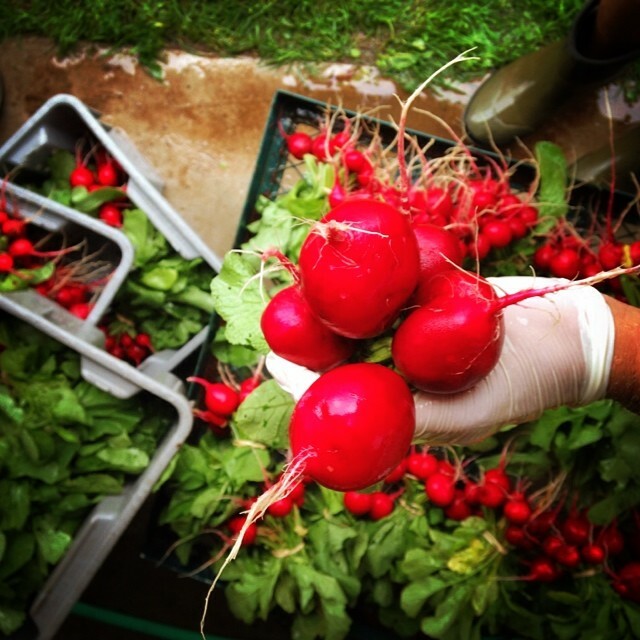 This entry was posted in About produce, Farm News and tagged #organicveggies, buy local, radishes. Bookmark the permalink.